"Residue numbers refer to human receptor sequences. The generic numbering scheme for GPCR sequences (73) is also used to make possible comparisons among the different GPCRs. power of the approach. Notably, the computational method is also capable of providing useful information about conserved interfaces in oligomeric assemblies larger than dimers. Numerous studies using crosslinking have demonstrated that GPCRs in the membrane are dimeric or oligomeric complexes (26,31,36,65-67). These studies used relatively long, lysine-reactive bifunctional crosslinking reagents, which made it impossible to infer the specific residues or regions that were crosslinked. To directly identify the dimer interface, we designed a strategy to use cysteine crosslinking (11) of our collection of D2 dopamine recep-tor-substituted-cysteine mutants (59,68). It was essential to develop a system that would allow a non-crosslinked receptor to run as a monomer on nonreducing SDS-PAGE. Our background construct FLAG-D2 dopamine receptor (11) ran almost exclusively as a heterogeneously glycosylated monomer of approx 65 kDa on nonreducing SDS-PAGE (Fig. 1A). Therefore, if this D2 dopamine receptor is oligomeric, the oligomer dissociates in SDS. Additionally, unlike some class C receptors, the D2 dopamine receptor is not an obligatory disulfide-linked dimer in the plasma membrane (69,70). As a control before introducing engineered cysteines into FLAG-D2 dopamine receptor for disulfide crosslinking experiments, we reacted FLAG-D2 dopamine receptor in intact cells with copper phenanthroline (CuP), an oxidizing reagent that promotes the formation of disulfide bonds directly between cysteines (71,72). Reaction with CuP produced a new band of approx 133 kDa (Fig. 1A), which is approximately twice the size of monomer (11). The fraction of total density that was present in the approx 133-kDa band was plotted against increasing CuP concentrations (Fig. 1), providing half-maximal crosslinking at 60 ± 10 |M CuP and maximal crosslinking of 80 ± 14% (n = 3). onstrating that this Cys at the extracellular end of TM4 forms the CuP-induced disulfide crosslink at a symmetrical homodimer interface. 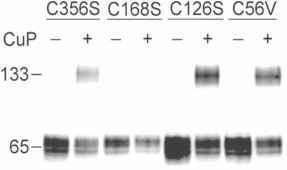 However, mutation of Cys168458 to Ser does not prevent interaction at this D2 dopamine receptor dimer interface, based on the crosslinking of this construct observed when another residue at the same interface is simultaneously mutated to cysteine (unpublished observations). Because crosslinking requires that only one of the two cysteines involved is modified initially by the reagent, and the derivatized cysteine then reacts by collision with the second unmodified cysteine, the rate of collision must be much faster than the rate of initial modification. This is consistent with the cysteines being very close initially. The very high fraction of receptor that can be crosslinked, the apparent specificity of the crosslinking (based on the appearance of a single homodimer band), and the lack of crosslinking of Cys56154 (which, based on the bovine rhodopsin structure, has a lipid accessibility similar to Cys168458) all argue for the proximity of the TM4 cysteines in the native state. Therefore, in the membrane, D2 dopamine receptor, untreated with CuP, very likely exists as a homodimer, but this dimer does not survive detergent solubilization. Our finding that the site of crosslinking in D2 dopamine receptor is Cys168458 at the extracellular end of TM4 is consistent with the hypothesis that TM4 forms a symmetrical dimer interface. Notably, the computational method we described earlier predicted C4.58 as a possible dimeric contact in D2 dopamine receptor, together with I448, T455, and L460. To reduce the number of false-positives among the predicted correlated mutations and to reveal additional loci of interaction between monomeric interfaces as discussed in detail earlier, we recently built geometrically feasible configurations of D2 dopamine receptor homodimers (in preparation). The information available from these monomer-based models is currently guiding experiments that are serving to map the entire interface of D2 dopamine receptor dimerization, with the goal of understanding the role of the interface in ligand binding and receptor activation and of discovering mutations that disrupt the interface between monomers, which therefore interfere with receptor function. 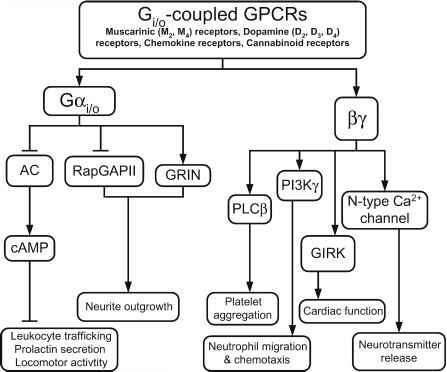 Because of the success in the application of our interdisciplinary approach to D2 dopamine receptors, we propose to use our methodology as a tool to provide new insights into the understanding of the structural basis and functional consequences of GPCR oligomerization.